During the last century the increase of temperatures was two times higher than the global average. The over proportional rise in the wider polar region during the 1920s and 1930 is well established. Only recently K.F. Drinkwater, confirmed that this time period saw a dramatic warming of the northern North Atlantic. But it needs nevertheless to be acknowledged that the available data series have their limits. Actually, the most important data required from the oceans interior do not exist for most of the 20 th century. Only over the last two decades, some improvements have been made. Until the end of WWII and another one or two decades, a systematic ocean data collection did not exist, with the exception of the random sampling of the sea surface temperatures made by vessels and few coastal locations. But these measurements were sparsely, selective and as data series insufficient. Concerning the collection of air temperature data in the Arctic region the situation is better. 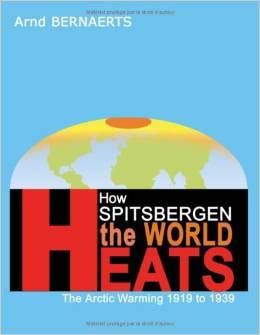 At Spitsbergen, the first permanent temperature data series began in 1912. In other places in the Nordic Sea areas, e.g. North Greenland, Jan Mayen, and Bear Island, weather records date from the 1920s. Actually, for the first quarter of the last century, solid data concerning the polar region is limited and has to rely on a number of single expeditions and interpretation of secondary observations. Another probable investigation source is the change of the ocean ecosystem. Already back in 1941, J.N. 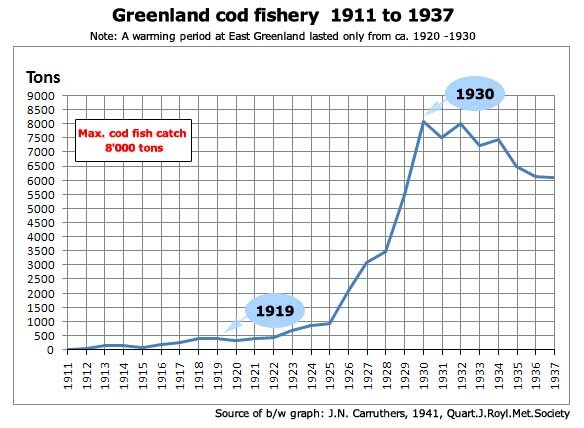 Carruthers published an impressive graph showing the great increase of the cod fishery of the Greenlanders since ca. 1926, due to the higher water temperatures. This phenomenon in the northern North Atlantic has been subject for a number of papers since long. While J.N. Drinkwater suggests that such information may provide clues what to except under future climate scenarios, the changes of the ocean ecosystem since the sudden arctic warming commenced in the late 1910s could presumably be of greatly assist regarding the question what triggered the ‘climatic revolution’ in the late 1910s, and from where and how the event developed. Nevertheless, this investigation will leave the changes in the ecosystem aside and concentrate on the available temperature data. As it is not possible to rely for analysing the early arctic warming on any sufficient ocean data series, the available air temperature data records have to be used instead. But how should the available series by used? Already the scientist who discussed the warming in the 1930s preferred for their analysis statistical means covering several years, usually 10 years. Such approach may be useful for many research topics, but not very helpful in a case as the sudden arctic warming. See for example the R. Scherhag graph, on global temperatures anomalies from 1921-1930, which actually indicate a global cooling except for the region north of 75ºN. The important aspects for our investigation are the differences observed in the data series recorded at a local, and regional level, as well as the seasonal and monthly relation. Local : Spitsbergen, latitude ca. 80 degrees North. Regional : Arctic/Polar region, at least higher than 60º North. Land-based air temperature observation, to which data series from Spitsbergen belong, in principle. However, it should be observed that, due to the permanent and extended sea ice-cover, at the north of Spitsbergen, the island is like an inner continental place. But as the southern flank of the archipelago is open to the sea and the closest continent is almost 1000 km away. The South-Sector is under very strong oceanic influence. Sea-surface air temperatures (SST), which play no important role in this investigation simply because they do not exist in any reasonable number and time for the period in question. Seasonal temperatures are a particular interesting aspect in the elaboration statistical weather data. In this respect, Polar Regions at high latitudes are an outstanding example. In the regions above the Arctic Circle (66° 33′ 39″ North) , sun ray can be excluded from the list of possible factors which influence directly short term weather conditions during the winter season, because it brings only a very a modest contribution in the early or late winter period. At more southerly latitudes, including North- and Baltic Sea (both above 50° North) at least, the influence of the sun decreases in wintertime, so that a clear distinction between seasonal data series may offer a strong analytical tool. Monthly mean data is an equivalent tool of the seasonal temperature measurement, as explained in the previous paragraph, only on a shorter term. Their uses make sense in exceptional cases. Spitsbergen is one. In autumn, the Nordic Sea reaches its maximum temperature due to the sun warming up. By December a considerable part of the summer heat has been released into the atmosphere, which means that there is temporarily a high, indirect influence of the sun. By the end of the year, summer heat is considerably diminished, and heat needs to be transported to a location like Spitsbergen via air or sea currents coming from great distances, or from the ocean depths . In our research and efforts to explain the big warming at Spitsbergen and its causes, air temperatures series play a major part. Focusing on certain aspects such as location and time sequence may reveal the source of the warming. Other information will be provided whenever available and reasonably possible. IPCC – Climate Change 2007, WG I, The Physical Science Basis; Summary for Policymakers; released in Paris on February, 2nd, 2007 , http://ipcc-wg1.ucar.edu/wg1/docs/WG1AR4_SPM_PlenaryApproved.pdf . Kenneth F. Drinkwater, 2006, “The regime shift of the 1920s and 1930s in the North Atlantic”, in: Progress in Oceanography, p.134-151. J.N. Carruthers, 1941, “Some Interrelationships of Meteorology and Oceanography”; Quarterly Journal of the Royal Meteorology Society, p.207-232; with reference to a paper by Ad. S. Jensen. For example: A.J. 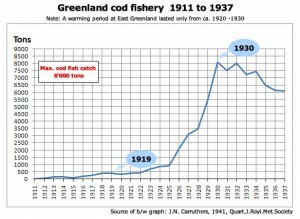 Lee, 1955, “Influence of Hydrograph on the Bear Island Cod Fishery”, in: Ministry of Agriculture and Fisheries”, Fishery Investigations, Series II, Vol. XVIII, No.4, London 1955, p.72-107. See also: K.F. Drinkwater, op. cit., References. See previous Chapter: Introduction; with reference to: H.W. Ahlmann; “Research on Snow and Ice, 1918-1940”, The Geographical Journal, 1946, p.11-25. 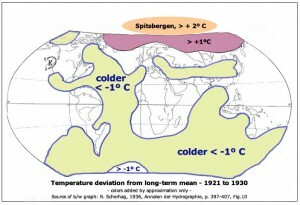 R.Scherhag: (see: top graph above), 1936, “Die Zunahme der atmospherischen Zirkulation in den letzten 25 Jahren”, in: Annalen der Hydrographie und Maritimen Meteorologie, p. 397-407, Figure 10. The Arctic Circle is an imaginary line that marks the latitude above which the sun does not set on the day of the summer solstice (usually 21 June) and does not rise on the day of the winter solstice (usually 21 December). North of this latitude, periods of continuous daylight or night last up to several months at the North Pole. May be that this is meant by K.F. Drinkwater when arguing that a bottom-up process were the primary cause of these changes without further elaboration. K.F. Drinkwater, op. cit., in: Abstract.